It may be easy to forget at times — like when your dog just mounted Uncle Irving’s leg or tagged Aunt Margaret’s backside with his muddy paws. 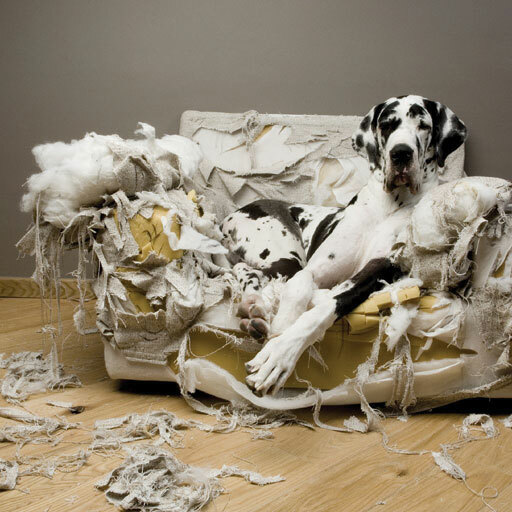 But it’s true: your dog isn’t doomed to be bad and he can learn to be good. In a flabbergasted, tried-everything, oh-so-mortified moment of training frustration, you might wonder if your dog is just too . . . what? Hyper? Ditsy? Stubborn? Well, no. She’s just being a dog. “Most of the behaviors people struggle with are normal — undesirable to people but normal for dogs,” says Annie Ingersoll, Certified Pet Dog Trainer (CPDT) at Willamette Humane Society in Salem, OR. As head of the shelter’s behavior and training program, she’s worked with countless dogs. Any dog can learn, she promises. With consistency and practice, “The common behavior problems are almost always easily resolved,” she says. So, rest assured: your dog can get over her issues, whatever they are. But how? A trainer is a great place to start. If you’re even in the general neighborhood of that frustrated/flabbergasted/mortified place, you definitely need a qualified trainer to guide you out of there. A CPDT is educated in dog behavior and tested in effective techniques. When you’ve found a credentialed trainer, Ingersoll recommends asking if he or she uses positive reinforcement techniques and stays current on training methods. An experienced, qualified CPDT can help identify underlying challenges and craft a plan to address them. The most common problems fall into one of three categories, says Ingersoll: behavioral issues, training issues, and impulse control. Behavioral issues can require the most time and effort to resolve. “People will call and say they have a fearful dog who needs to be trained not to nip when approached by strangers,” says Ingersoll. “But we can’t just train a dog not to be fearful.” In behavioral issues — problems such as aggression, fearfulness and separation anxiety — the focus is on changing the dog’s emotional response to a situation. In those cases, “you may need to work with a trainer one on one and create an in-depth behavior modification plan, and also work with a veterinarian who might prescribe medication.” While behavioral issues require time and patience, Ingersoll says they always improve with dedicated, consistent work. Ingersoll experienced only a couple of severe cases of separation anxiety that weren’t fully cured. “Did it get better? Yes. It became manageable,” she says. Separation anxiety is among the top reasons dogs get surrendered to shelters, and a common reason pet parents seek her out or attend her classes, which are open to everyone. Impulse control is a reflection of maturity and social skills, while specific skills are learned through training. If a dog sits when told but pops back up as soon as he’s distracted, he needs some impulse control to go with his training. Knowing this, it’s easy to see how many common challenges like pulling on the leash or charging the door are a combination of training and impulse control. No matter the challenge, a good professional trainer can be your dog’s best friend. A well-rounded training approach will teach him the skills he needs while helping him develop the self-control to remember those skills when he’s out-of-his-mind excited to see Aunt Margaret and Uncle Irving. Annie Ingersoll, CPDT, offers a variety of group and individual training options. Details willamettehumanesociety.org or call 503-585-5900 ext. 326. Posted in Behavior/Training, Feature, Life with Pets and tagged with Training, Behavior, Dogs. March 1, 2012 by Michelle Blake.